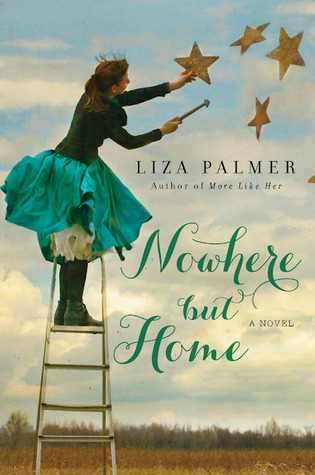 Thanks to TLC Book Tours, we're pleased to present a review for Nowhere But Home, a new Southern contemporary fiction story from Liza Palmer. Make sure to check out the rest of the tour stops for more reviews, and keep scrolling down to enter to win a copy of this book for yourself! So if you're a regular reader of the blog, you might guess that this book is maybe something that doesn't appear to be up my alley. Most of my reviews are for like, zombie books and dystopians and the like, rather than books that kind of border on chick-lit. But something about this summary grabbed me, and I'm very glad that I took a chance on it, because this was a phenomenal read. As a former small-town girl who escaped to the big city, there were some parts of Queenie that I could really identify with. Of course, I didn't have near the drama in my life that she experienced, but I am well familiar with that feeling of needing to run away from the place that made you, at all costs, so I was drawn to her and invested in her story and growth. She's a perfect example of a character growing and changing over the course of the story. She starts out bitter and jaded and angry, determined not to stay in North Star for very long before she moves on to better things, but she matures over the course of the book, and it happens in a mostly realistic way. A lot of books like this, the character's decisions seem to come out of left field, but Queenie's thoughts and decisions were very clear and understandable. I didn't find myself angry over the life that she winds up chosen, because it made sense for her. This book really does capture the football-obsessed, everyone-knows-your-secrets way of life that occurs a lot in small places like North Star, Texas. And for a book that could have just been fluff, Palmer really gets at the heart of the matter: a lot of the problems that go on in towns like these are class and social status issues, and she doesn't shy away from the fact that Queenie's family has always been seen on being from the wrong side of the tracks, no matter what any future Wakes did to try to change that perception. Everyone in this book is running from something, trying to hide something -- there are a lot of ghosts (not literal ghosts) of North Star past lurking in the shadows -- and everyone has to come to terms with how to deal with the past in order to move forward. There are a lot of really moving scenes in this book and I found myself getting choked up more than once while reading. Parts of it were pretty predictable -- if you've read any romance or general contemporary women's fiction ever, you'll be able to guess what happens -- and everything wraps up a little too easily compared to the real world, but none of that really took away from my enjoyment. I really enjoyed this book and would recommend it to more mature readers -- aside from profanity and some adult situations, Queenie is in her early 30s and I feel like her story would resonate most with an adult audience. I was surprised by how much I enjoyed this book, and I want to give one of you the chance to read it for yourself! Enter in the Rafflecopter below to win an ARC of this book. You must be 13 or over to enter and should have a US mailing address to win. I love when I break out of my comfort zone and discover something really amazing! I'm glad this book was like that for you. Thanks for the awesome giveaway! This book sounds fantastic.